There is a photograph that I grew very fond of as a child. This photograph was a framed picture that hung in my Aunt’s dining room in Cleveland, Ohio. It was a very old picture picture of my elderly Great-Grandmother sitting beside what appeared to be a lake. She was sitting in front of a spinning wheel as she spun yarn. Her eyes are fixed to her task at hand. She looks neither happy or sad. She does however, appear very content. It is over thirty years since I last saw that picture. Nevertheless, I still remember it well. I have no doubt that what made the photograph so memorable was the fact that my Great-Grandmother could actually spin wool. About fifteen years ago, my eldest daughter and I began to knit. To this day we continue to happily share this pastime. It did not take long for us to accumulate an impressive collection of a variety of yarns in just about every colour, both thick and thin. About 10 years back, my Daughter shared with me her plans to learn how to one day, spin yarn. I’m afraid that I did not share her enthusiasm. Where, oh where, would we store the fleece, the spinning wheel, and all the other accoutrements needed for this wool gathering? Just about every drawer and storage bin in my house contains yarn, yarn, and yet… even more yarn. In spite of my misgivings, my Daughter made it clear to me that she was not going to give up. My pertinent Daughter began to read all the magazine articles she could find on how to spin wool. She then watched spinning demonstrations on YouTube. Before I knew it, she was visiting local fibre stores and talking to people who knew how to spin. This was all in preparation for the time when she would be able to pursue her new undertaking. And I am so very glad she did. Two years ago, she was finally able to purchase her spinning wheel. That was when she began creating some of the loveliest yarns that I have ever seen. I am proud of her spinning achievements, and I’d like to think that her Great-Great Grandmother, the same one pictured spinning in that beloved photograph would be proud too. Now, I have an incredible array of eclectic yarns, while local wool fibre artisans are being supported. Further, my Daughters dreams of spinning have come to fruition. The first time that I saw scented magic markers in the toy section, I instinctively knew that this was a very bad idea. Giving a child a marker, and then telling him that it smells nice is openly telling the child to stick the marker up their nose. This is an inevitable disaster waiting to happen. Besides, why does ink have to be given a phoney smell in a world where wearing a fragrance is becoming taboo in public places and allergies to chemical fragrance is on the rise? Needless to say, I didn’t buy the markers. Not then, not ever. Try to imagine my horror one afternoon as I was picking my youngest daughter from nursery school. I took one look at her and saw some sort of monstrosity under her pretty little nose. She looked like someone had tattooed her upper lip with an ugly moustache. “What happened?” I asked the first teacher that I could find. The teacher looked at my daughter and laughed. “Will it come off?” I asked her while trying my best not to sound worried. “It should eventually…” She replied. No doubt, some colours may be easier to fade than others. Amid the green, purple, and orange spots under her nose were big blotches of brown and black. Obviously, their fragrances must have either been delicious or hard to detect. Why else would there be dime shaped solid circles of dark ink. For whatever reason, I do not remember what happened in the hours or even days that followed. It’s safe to say that what wouldn’t wash off, I would have tried to get off with cold cream. Further, I highly doubt that we made any public appearances until the worst was over with. Dear Parents, Grandparents, Aunts, Uncles, etc. Do not give young children scented markers. Their world is smelly enough. I’ve recently realized that the things I learned from my family and relatives as a child had a greater impact on my life than I ever could have imagined. When I was very young and living in Toronto, I spent a great deal of time with my Aunt, Uncle and two cousins. Further, my Aunt cared for me while my parents worked. Also, from the time that I was six years old, each Sunday morning my Aunt, Uncle and cousins would drive well out of their way to pick me up to take me to Sunday School and Church. For this, I will always be grateful. While my Uncle worked very hard to provide for his family, my Aunt was a very talented and creative woman. 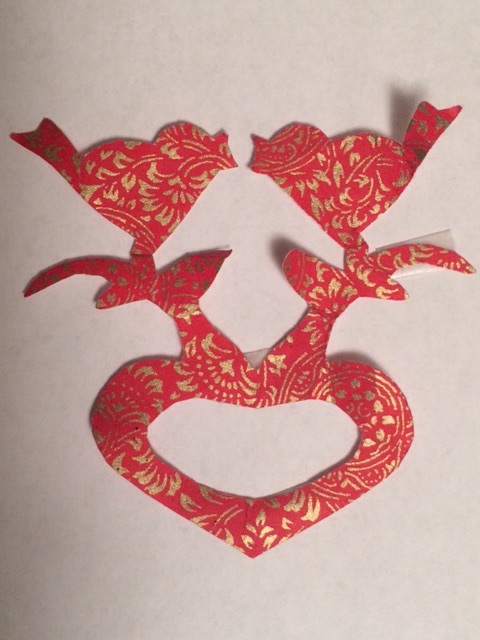 She was able to make exquisite paper cuttings of birds, trees, flowers and of course hearts… out of ordinary paper and a pair of scissors. During the 1960’s she sewed teddy bears for every child she knew and gave them freely, and with great joy. I still have a photograph of the one she made for my Sister. And how she loved to knit and crochet. My Aunt always had all kinds of wool in every colour and was quick to share while encouraging us to create whatever we pleased. She taught me how to braid. Those of you who have never met me may not understand the significance of this, but family, friends and those around me do. For the past twenty years, a long braid has been my signature hairstyle. It’s easy and very practical. And I learned how to do it from my Aunt. There are many happy memories of my cousin and I practicing how to braid using long multiple strands of wool that my Aunt would prepare for us. I became very good at it. And then, later in life, it was with the greatest joy that I was finally able to braid my little girl’s hair. Those moments were epochs in my life. The simplest and most basic lessons that we learn in life are usually the ones that mean the most and stay with us the longest. …Like learning how to make Scherenschnitte birds, trees, flowers and of course… hearts, out of ordinary paper and a pair of scissors. In my view, a brand new ball of sweetly coloured wool is a wonderful thing. It holds so many possibilities. 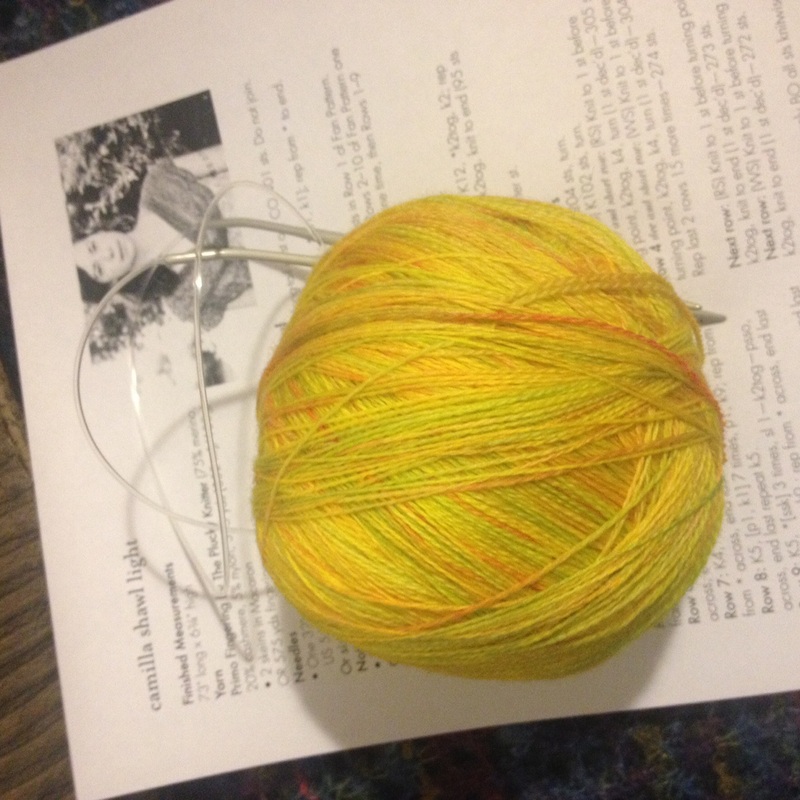 Once I am introduced to a fresh hank of yarn, it’s important that I carefully consider what it wants to be. All the above are carefully considered and weighed. There are times when I make a decision, only to have the yarn correct me shortly after the work has begun. Usually in the form of a knitting error, where I have no choice but to start all over again. Take for example my latest knitting project. The fine and light merino yarn hand-painted with aqua tones and black marbling was first destined to become a simple triangle shawl with a picot edging. I cannot tell you how many times I had to start over because I miscounted or was unhappy with the way the stitches were falling. 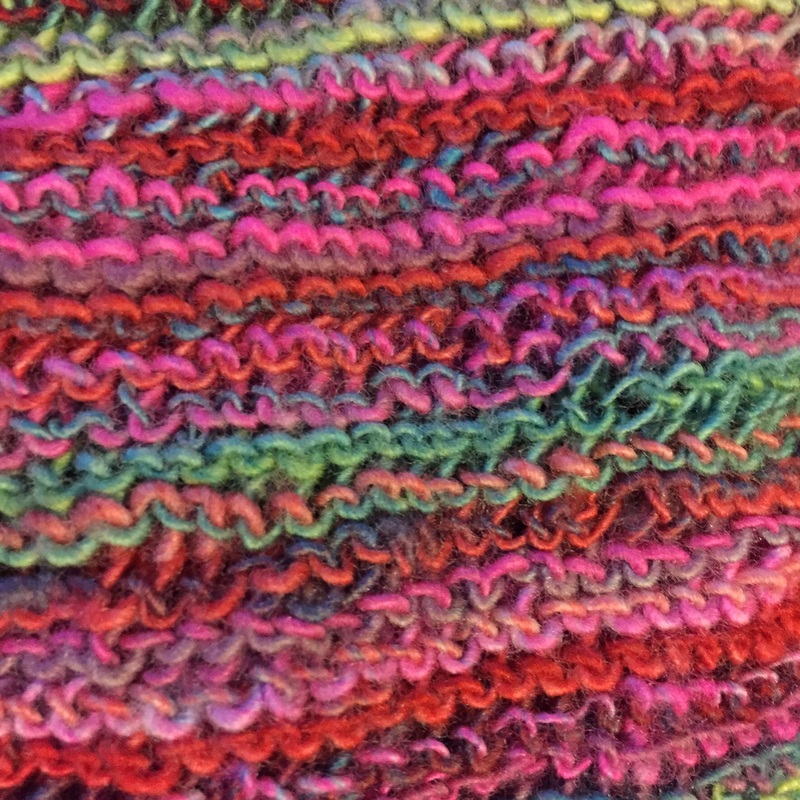 In the end, out of frustration, I abandoned the idea of a shawl in favour of a slouch hat. Interestingly enough, a day later and the hat is now nearly half done with zero mistakes or misdemeanours. I just accept it and move forward. An object lesson, well learned. If only more of life’s daily lessons were so easy to learn from.